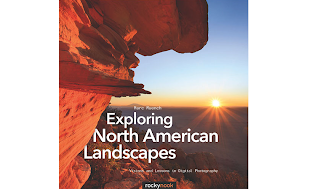 While I don’t think the author Marc Muench was thinking of Cleveland when he wrote this book, never-the-less, most of his principles of good photography do apply. Whether you are shooting the shores of Lake Erie, the trails in Cuyahoga Valley National Park or the hills of Hinckley, there are some great tips and techniques in this book. If you recognize the name Muench, it’s because Marc is the third generation in a family of outdoor landscape photographers extraordinaire. His grandfather was Josef and his dad was David. Just like his predecessors, Marc is making a name for himself in landscape photography. An accomplished skier and hiker, some of his most beautiful work is done in the mountains, showing skiers cutting fresh tracks in the snow. His mountain top sunrises are equally amazing. The front of the book is about chasing the light and how persistence pays off. Recounts of various trips reinforce the idea that it takes time to make something extraordinary. Just looking at his prints, you’ll be a believer in his methods. Even more so, you’ll gain a number of new ways to realize your vision, the holy grail of photography.